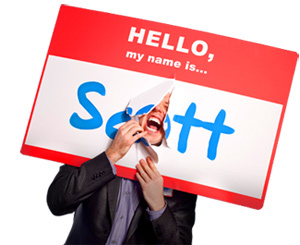 8 Ways to Make Your Name More Invokable - HELLO, my name is Scott! If people start telling YOU that they’re telling others ABOUT you, congratulations. Not in a religious way or anything. I assume your clients, friends and fans aren’t setting up candle-lit shrines with pictures, newspaper clippings and locks of your hair in their bedrooms. THE POINT IS: Having someone “invoke” your name is exponentially more powerful, more memorable and more valuable than having someone just “say” it. When people invoke your name, they’re building your credibility. When people invoke your name, they’re advancing your mindshare. 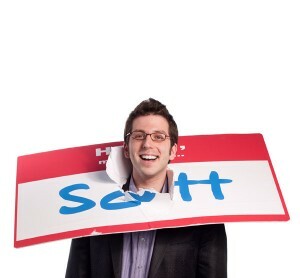 When people invoke your name, they’re enhancing your personal brand. Ultimately, being invokable is a combination of being quotatable, remarkable, referable and aboutable. THE CHALLENGE IS: How can you continually boost your invokability? Because straight-up ASKING people to do so won’t work. Nobody is going to invoke your name just because you put in a request. Word of mouth is casual, unsolicited and authentic. It’s just like referability: The minute you try to force it, you lose it. 1. Purple cows MUST give milk. Building remarkability into your products and services before they’re released isn’t enough. Baseline remarkability is only the beginning. You need preserve originalness by assuring that your unique value proposition has (some) transformational purpose connected to it. (Remarkable) + Relevant + Worthwhile + Marketable + Substantive + Consistent. Any name connected to those attributes will become impossible NOT to invoke. Are you remarkable but inconsequential? 2. Free is your friend. Speaking of purple cows. Seth Godin and Jeffrey Gitomer are two people whose names I invoke almost daily. And it’s not just because they’re my friends, but also because they freely distribute their wisdom. Everywhere. Lesson learned: Don’t come off as someone with a sense of scarcity. It’s hard to invoke people who are selfish with their knowledge. Are people working energetically to favorably and publicly mention YOU? 3. Consider your own invocations. Next, think of the three people whose names you invoke most frequently. Ask yourself: What have they done – or what do they continuously do – that makes YOU so willing to drop their name? Is it because of their attitude and actions; or more of a foundational component like character? Either way, your job is twofold: (1) Pinpoint that which drives their invokability, and (2) Challenge yourself to achieve similar standards in your own life. People will notice, and people will talk. Whom do you invoke regularly, and why? 4. Put yourself in invokable positions. In 2000 when I began wearing a nametag 24-7, I was a college student at Miami University. One of the first trends I noticed – other than the weird looks from strangers and the inability to get a date, EVER – was that my professors started calling on me during class a lot more. Huh. Maybe that’s what happens when you put yourself in an invokable position: It’s sheer probability. In fact, you wanna hear something kinda spooky? Fast forward to today, ten years out of college. The exact same trend of invokability happens to me when I take yoga class. Instructors – who have never had me in class before – will use my name constantly. And I’ll get these weird looks from the other students because they think I’m, like, sleeping my way to the front of the room. Which I’m not. Hell, I’m not even that good at yoga. But the role of the instructor is to challenge and support the student’s practice. And it’s just easier to do so when there’s a guy with a nametag tattooed across his chest staring back at you. Lesson learned: If you want to be in the right place at the right time, you need to be in a lot of places. How many places are YOU in? 5. Stick yourself out there. My favorite Law of the Universe is, “Whatever you want to get, just try GIVING that thing first.” It works for pretty much anything: Love. Trust. Kindness. Referrals. Occasional dirty looks. And the cool part is, the same principle applies to becoming more invokable: Do it for others, and they will do it for you. Start by becoming an invoker yourself. Period. Now, one word of caution. Steel yourself against the temptation to become one of those incessant, name-dropping bottom feeders who spends WAY too much time hitching free rides on the coattails of others. People will assume you can’t think for yourself, and you will lose. Are you willing to ante up first? c. Who do I know that is already on that person’s radar? 7. Stop occupying the middle. People will recall and invoke your name if the philosophy attached to it is unexpected and non-template driven. Your challenge is to build an original, fertile and uncommon Theory of the Universe. Your strategy is to maintain contrarian positions to as many subjects as you can. And your action item is to make a list of all the conventional wisdom, traditional principles and standard operating procedures you disagree with or oppose to. Is your thought leadership position a waffle? 8. Thank your invokers. When people invoke your name – either in person, during a presentation or somewhere online – ALWAYS thank them. Send an email, instant message, wall-to-wall on Facebook or tweet them a direct message. Tell them you appreciate the kind words. And, in your daily Gratitude Journal, be sure to write down the invokers you’re thankful for that day. I do it every morning. EVERY morning. And it works. Remember: What you appreciate, appreciates. Who did you thank today? Ultimately, becoming more invokable is about achieving mindshare, not marketshare. Start executing these strategies regularly. Find the ones that work best for your business model. And I promise your invokability will start to build PROFIT-ability. Then maybe you can FINALLY finish that Scott Ginsberg shrine you’ve been working so hard on. How invokable is your name?